Botox may be the right choice for your aesthetic purposes if you want to look young and refreshed. Botox applications help make your fine lines and wrinkles disappear. Botox also helps in cases of limb spasticities (due to paralysis) and hyperhydrosis (excessive sweating). Botox gives real and noticeable results in its aesthetic applications. No surgery and no recovery time needed. That's why Botox has been chosen by so many millions of people and their doctors. 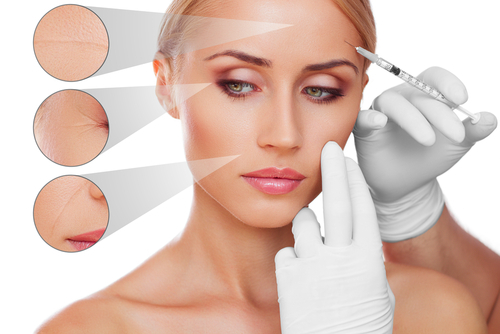 Botulinum Toxin A (BTX - A), commercially known as Botox, has revolutionized the world of cosmetic procedures. More than 11 million women and men have already experienced the proven results of Botox for aesthetic purposes. With Botulinum Toxin being so widely used and having achieved a permanent place in the world of cosmetic procedures, its cosmetic effects are well established now. These just-mentioned lines are common presentations in the aging face due to loss of dermal elasticity, which may be accelerated by photodamage (sun damage), smoking, exposure to the sea, and other factors. In younger patients, hyperactivity of the facial muscles may cause significant lines that convey and appearance of age, fatigue and frustration. BTX-A provides a strikingly effective way to treat these facial lines by acting on the underlying muscular activity responsible for their formation. Botox injections provide a non-surgical means to produce greater symmetry of the eyebrows. The aim of the treatment is to elevate the lower eyebrow to the same level as the higher one. Contraction of the pretarsal orbicularis oculi (involved in the blink reflex) during smiling tends to decrease the size of the palpebral aperture. Hypertrophy of this muscle can give a "jelly roll" appearance to the lower eyelid, enough that some individuals may complain that they look overweight and desire a rounder eye, particularly when smiling. Injection of BTX-A into the lower pretarsal orbicularis opens the palpebral aperture both at rest and smile. looking tired or sad when feeling well. The use of mid- & lower face is also well treated with Botulinum Toxin A. Whereas rhytides of the upper face are primarily dynamic, the lower face is subject to both dynamic and static forces. Dermatoheliosis, age-associated volume loss and decreased resilience all contribute to the static rhytides. as an adjunct to other procedures (microdermabrasion, laser treatment, radio-frequency treatment, combination treatment with fillers) aimed at rejuvenating the lower face. The aging neck is increasingly recognized for its aesthetic importance. The aging neck may present an aesthetically undesirable apprearance. The skin itself is subject to degenerative changes: loss and disorder of collagen and elastin. External factors, primarily ultraviolet radiation exposure, lead to aberrations in the connective tissue matrix of the skin. Ultraviolet exposure also creates vascular changes leading to Poikiloderma of Civatte. Deleterious alterations in the extracellular matrix combined with the downward vector effect of gravity leads ot sagging of both skin and the underlying platysma muscle. Fat accumulation and fat repositioning in the subcutaneous and subplatysmal planes leads to localized adiposity. With aging, new adipose tissue can accumulate in the submental region, just as it can in any other body location. A fat repositioning leading to a pseudo-excess of submental fat can also develop. As the platysma loses integrity and separates in the midline, the muscular buttress holding the subplatysmal fat fails and the fat descends, becoming clinically apparent. In order to achieve optimal improvement, a combination of modalities may be required. Lasers and light-based therapies are successful in the treatment of poikiloderma of Civatte. Liposuction can be used to eliminate subcutaneous excess adiposity. Open dissection can remove the subplatysmal fat pad. Sagging of the platysma can be managed surgically through techniques such as corset platysmoplasty. It is the platysmal bands and horizontal 'necklace' lines that are most amenable to BTX therapy.